Thus, an investment of US$1,000 that yields regular annual savings of US$500 has a payback of two years. The annualized saving could be determined by a number of uneven cash flows, e.g. US$250 in year 1 and US$750 in year 2; here, the payback period is determined by adding up successive savings in the cash flow until they match the investment. If we are interested in the payback in months, then we would multiply the annual payback by 12. I am writing this post from Goa, on the West coast of India. 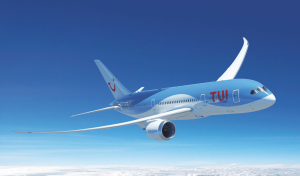 I flew here from Manchester, in the premium economy section of a Tui Boeing 787 Dreamliner. According to the ICAO carbon calculator  the aircraft will have burned 54 tonnes of fuel on each leg of the journey, which equates to 654kg of CO2 per passenger (2x the standard economy emissions due to the “premium” cabin seating). The plane was full, so I think the calculations are reasonable and, while I could argue that “premium economy” is not really twice the space or mass of standard economy, I don’t quibble with the figures. For change to happen, people and teams need two things: the capability to carry out the required action and the desire to do so. Capability reflects many aspects such as knowledge and skills, as well as resources like time and money. Motivation can be intrinsic due to beliefs and attitudes or extrinsic due to instructions, incentives, penalties or social norms. 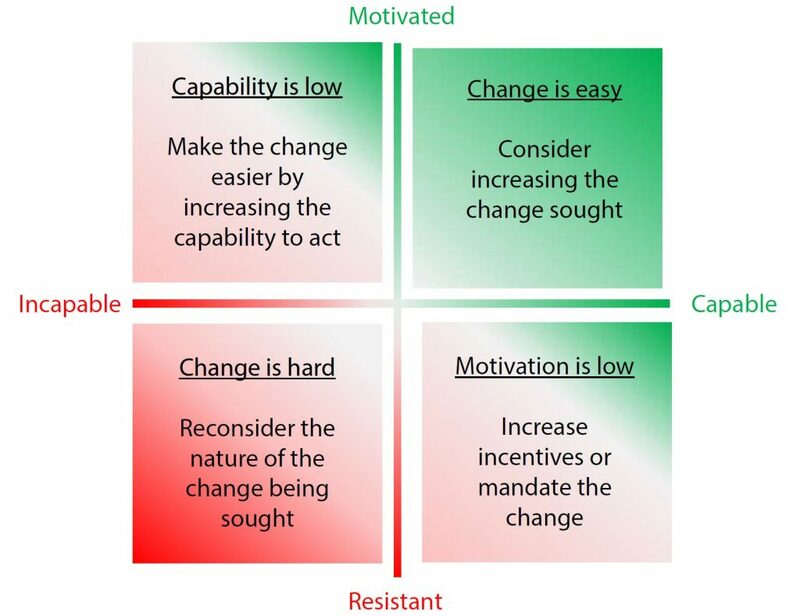 Understanding Capability and Motivation can help us develop the right strategy for change. Capability and motivation are related. An easy-to-implement behaviour change (i.e. one for where the existing capability to act is high) will need much less motivation than a challenging behaviour change (i.e. one which requires lots of resources, time, effort, risk-taking, knowledge, etc). Understanding the interrelationship between capability and motivation can dramatically increase the chance of success of our change programme. “How do you eat an elephant? Why, one bite at a time, of course”. In the section on availability barriers to resource efficiency, I argued that we can drive a successful efficiency programme by getting a lot of people to regularly dedicate a little time rather than by getting a few people to commit a lot of time. Clearly, we need to start with where people are at and it is often unrealistic to ask someone to make a large change in their behaviour from the outset. 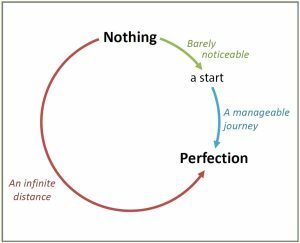 Indeed, asking for too much or holding back for “perfection” are the root causes of many programme failures I have observed with my own eyes. So starting small is a reasonable strategy. The popular Lighting tool has been updated to version 1.3. Previous versions may fail to return Latitude and Longitude when a user enters a location name, displaying instead “REQUEST_DENIED”. The reason for this is that Google Maps has started charging for geolocation requests used in our “mashup”, and so SustainSuccess has now opened an account with Google to cover the costs of these requests. 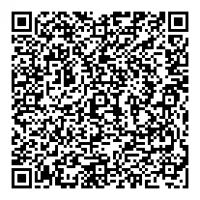 To protect our budget, we have limited the number requests per day, so if you get this message in version 1.3, please try again the following day or enter a Latitude and Longitude manually. To upload the new version, please follow the link, right. Is the EU Emissions Trading Scheme responsible for the collapse of flybmi? The airline has faced several difficulties, including recent spikes in fuel and carbon costs, the latter arising from the EU’s recent decision to exclude UK airlines from full participation in the Emissions Trading Scheme. So, I wanted to find out if this was really the case. First of all, the background. You may recall from my earlier post that the EU is facing a real challenge for its flagship ETS as a result of BREXIT. The problem is that allowances in the scheme can be traded freely between member states of the EU but if the UK leaves the scheme ahead of the current Phase (running to 2020), there is a very real risk that the now redundant UK allowances, would flood the market and so render the ETS ineffective at capping carbon emissions. The UK’s Green Building Council is consulting on what is meant by “Net Zero Carbon”. We need to make sure that the definition is effective. Hopefully, the definition will be a rigorous tool to help building developers and operators to achieve the maximum affordable onsite improvements in the building’s emissions. Once these onsite improvements are achieved, the definition will further set out how the residual emissions can be genuinely reduced through credible, independently verified offsite activities, leading to “net zero” or event “net negative”. Alternatively, the definition could be a cheap and nasty fig leaf facilitating another decade of flat-line performance on emissions in the property sector. In order to avoid the latter it is important that folks respond to the consultation on the meaning on “net zero” in buildings, which closes on the 1st March. Looking at the consultation, I would say that the outcome is finely balanced – so please do make the effort to understand the issues and make your voice heard in the consultation. 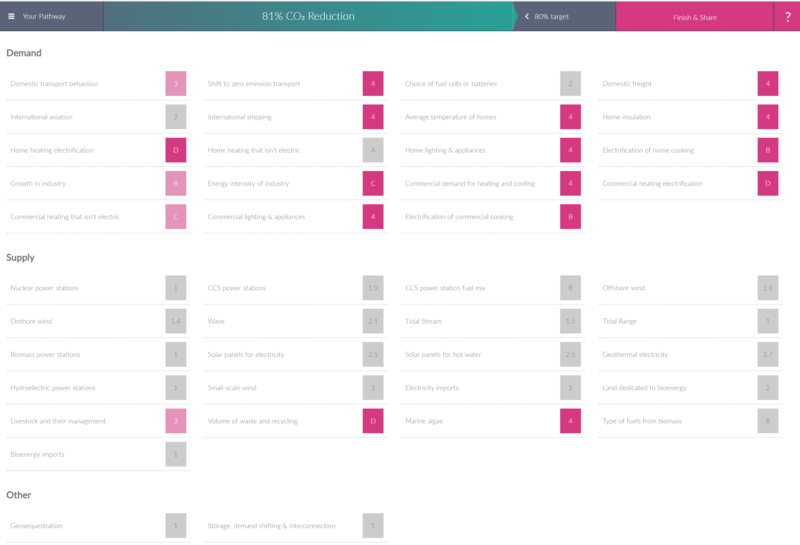 Filling in a response will take around ½ hour – what better use of your time? 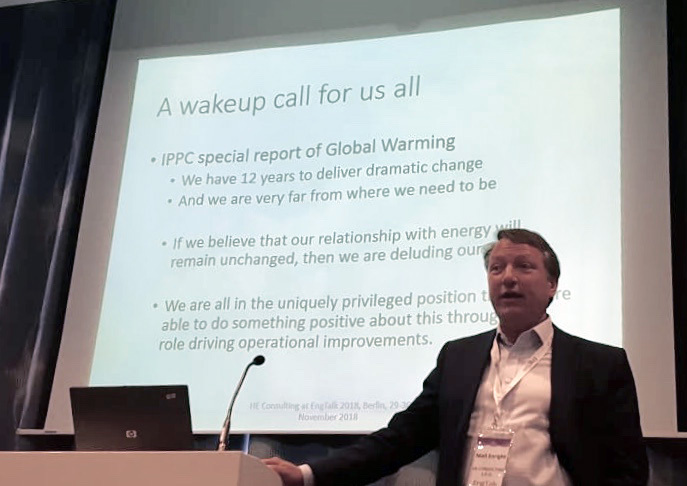 Just before Christmas I took part in two very different conferences, which brought into to stark relief the challenges facing those of us promoting a substantial and rapid reduction in global emissions. The first event was the prestigious “EngTalk – Excellence in Engineering & Factory Management” event in Berlin, which was attended by over 50 very senior global executives in leading manufacturing firms with roles such as “Director of Innovation”, “VP Manufacturing”, “Industrial Director”, “Head of Engineering” from organisations as diverse as Airbus, Bayer, GE, Philip Morris International, Philips, Pirelli, Magna, Novartis, Siemens and Volvo. Although there were presentations, it was less of a conference and more of a networking and idea-sharing event taking place over two days with a strong emphasis on one-to-one meetings and discussions. My role in the conference was to support Arne Springorun the MD of HE Consulting, an efficiency consultancy based in Prague with which I have had a long and enjoyable collaboration on successful projects such as an energy efficiency programme at SKODA CARS Mlada Boleslav Plant in the Czech Republic. I shared a presentation with Arne and it fell to me, as you can see below, to communicate the urgency of our response to climate change. 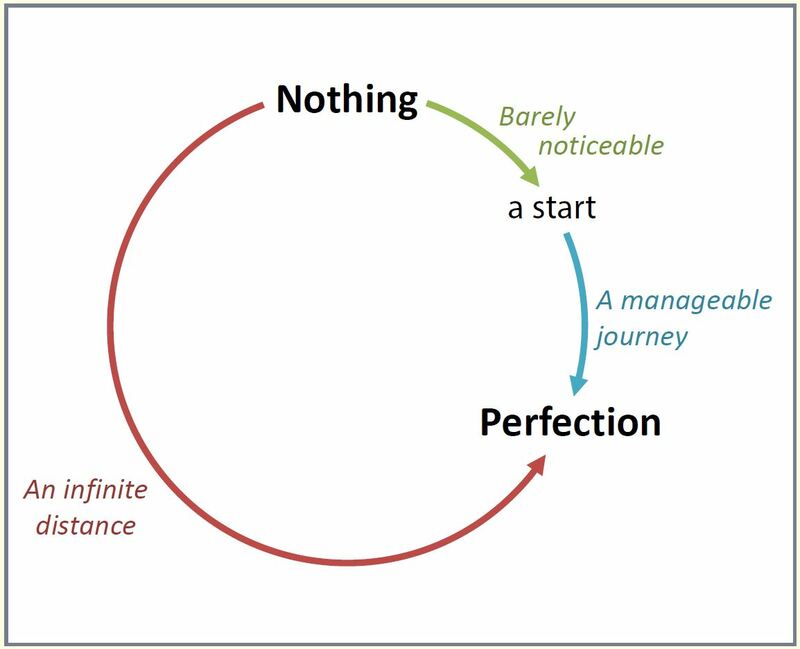 For a conference that was focusing on the major technical challenges facing manufacturing, the critical – dare I say it, existential – topic of “how to do more with less” was conspicuously absent. The big themes were Automation 4.0, Artificial Intelligence, Virtual and Enhanced Reality, Digitilazation and Big Data. With the exception of the pitch from some innovative compressed air systems manufacturers, energy efficiency was not mentioned by other presenters. In the 20+ one-to-one conversations I held with these senior executives, there was acknowledgement that climate change is part of the manufacturing agenda. But I got the impression that this was very much taken for granted, placed in the “problem solved” or “in hand” category; an issue to be dealt with in due course, but considerably lower priority than responding to the rapid changes coming about due to technological innovation. And yet it is these folks – the people who help shape the strategic and investment decisions for their organisations – who have a commanding role in solving the climate change challenge in industry. 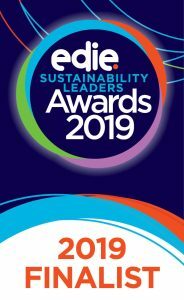 We are delighted to have been selected as one of the 10 finalists in the edie 2019 sustainability awards in the category of “Consultancy of the Year”. Our submission spoke passionately about the “need to do more with less” and our belief that our profession – as sustainability practitioners – has a unique and privileged role in solving some the most pressing challenges of our times. It is a huge honour to have been shortlisted. Being invited to celebrate the enormous contribution of the other finalists is both humbling and inspiring – the calibre of work, outcomes and people involved are truly astonishing. The main motive behind our entry was to make colleagues aware of the helpful tools we have made available to support energy and resource efficiency. If you are unfamiliar with us, I would invite you to explore our website and take advantage of these resources. These include Niall Enright’s free 840-page textbook on energy and resource efficiency and the lighting hours tool which fills an important data gap for driving better operation of lighting systems. The award winners will be announced on the 6th of February 2019. As part of the update of my book, and in preparation for a two-day energy management training course I am delivering shortly, I revisited the 2050 pathways model for decarbonisation of the UK economy by 80% by 2050. 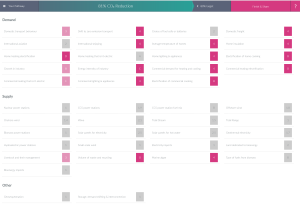 I took the plunge and completed my own 2050 scenario, achieving an 81% reduction, summarised in the actions illustrated above. My model is heavily focused on the demand-side, as you can see from the red colours in the upper section of the screenshot above. This brings home the fact that no matter how many wind-farms we put up, unless we change our heating and transport to electricity, the supply-side changes will have little effect. One particular quandary I had was how much land to dedicate to biomass. When I reached 78% emissions reductions, one of the few remaining ways to reach the 80% target was to increase the land use for biomass from 5% to 10%, or start to import biomass, neither of which I wanted to do. In the end, I achieved the target by turning down the average temperature in homes beyond what I really think is feasible. These kinds of decisions bring home the complexity of the energy system and the fact that no single technology can achieve the goal. 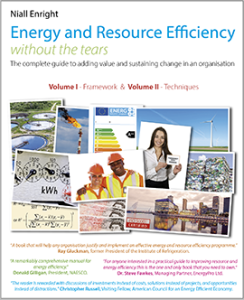 Just to let folks know that I have updated my Book Energy and Resource Efficiency without the tears – the complete guide to adding value and sustaining change in an organisation. The ability to change the text frequently is one reason why we have chosen to go with “print on demand”. The other is that it has a lower environmental impact as supply matches orders. The chapter on ISO 50001 has been completely updated as the standard has moved from 50001:2011 to 50001:2018. There have been other updates and corrections throughout the text including checking and updating all the web links in the 800+ bibliography at the end of the book. The free PDF has been updated as well as the print editions. Please do download the free PDF rather than buy a print version – not only is that more resource efficient but you will always have the up to date version! However, if you absolutely insist on buying a print version, then please do order it through this site. The new reporting regime follows the abolition of the Carbon Reduction Commitment (CRC) at the end of the second phase (31st March 2019 – although Annual Reports will still need to be submitted and allowances paid, so the administrative requirements will continue for a few months). 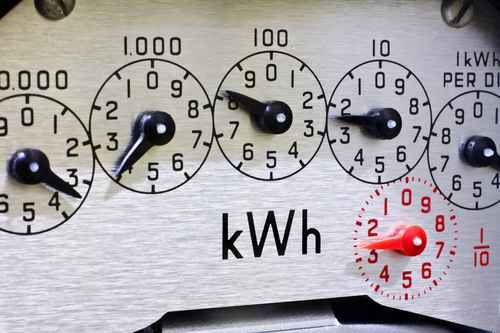 The £700m income that the CRC provided to the government will be replaced through significant increases in the Climate Change Levy (CCL), which are set to rise from 0.583 p/kWh to 0.847 p/kWh for Electricity and 0.203 p/kWh to 0.399 p/kWh for Natural Gas supplies (45% and 67% respectively, note that CCL other fuels such as LPG will also increase, see this link). The consultation response (available here) has answered a number of important questions about the new reporting regime. However a number of key issues remain unclear, as set out below. At SustainSuccess we are passionate about helping our clients achieve long-term value from their sustainability initiatives. Back in 2014, we helped set up Peel Land and Property’s energy management system. When, in 2015, the system was formally certified to the ISO 50001:2011 standard, Peel Land and Property became the first major UK property company to gain this certification. The Peel 50001 system has been very successful because it has focused on the value-adding aspects of the standard, and because it was built around the ideas and ways of working of the Energy Champions who have day-to-day ownership of the process. Peel’s success can be seen in the outcomes – the energy savings delivered by the team has reached £1.6m a year on a bill of just over £4m – that’s an improvement of over 30%! It was a honour for Niall Enright at SustainSuccess to contribute to an important UNEP workshop in Paris in May. 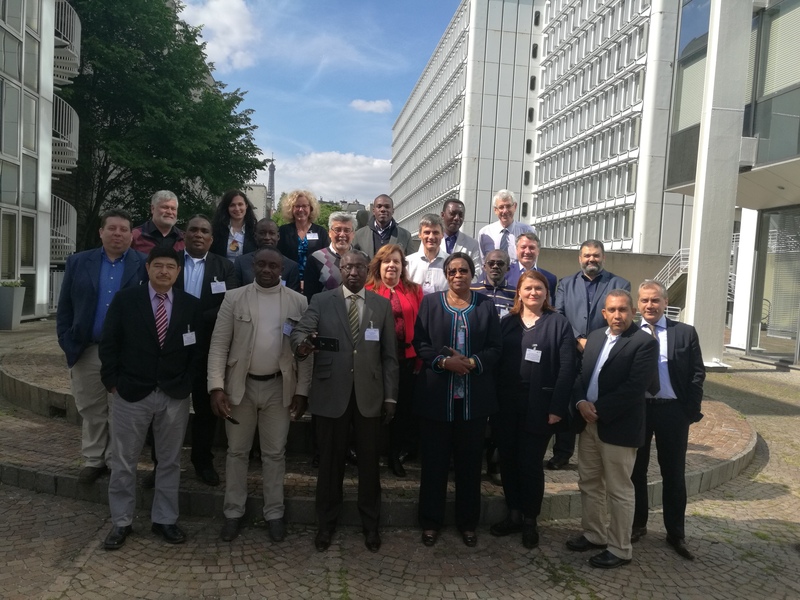 The workshop involved participants from Gabon, Mali, Senegal, Bosnia and Herzegovina, Honduras, Guatemala and The Dominican Republic. The delegates had come together for an introduction and tutorial about a tool to help their countries forecast future emissions of F-Gasses. Here we all are, in the courtyard of the UNEP offices in Paris. The background is that these F-gasses have a very high global warming potential, and so an international agreement has been reached to phase them out. This agreement is an extension to the Montreal Protocol which is seen as a remarkably successful example of what can be achieved in global environmental collaboration. The deal on the F-Gases is also named after the city where it was agreed, is it the Kigali Amendment to the Montreal Protocol.